Showing results for 'woo audio' in articles. At Chris’s request, I’ve consolidated my contemporaneous postings about RMAF into this show report. This is my second year attending RMAF at this venue, and like last year, it was very enjoyable. With the benefit of past experience, I was able to organize my time better, so got to see more of the rooms and exhibits than I did last year. Before I get any further, a word about what this report is, and what it isn’t. It IS a highly personal chronicle of my experience at RMAF. It ISN’T a preplanned show report, as the idea of publishing this on the CA front page came after the show was over. I make no claims of full coverage, as I planned some of my meanderings based on things I wanted to see. I could not visit some rooms, often because the room was too full or “a reviewer is in there.” I am only going to mention rooms and systems that caught my ear or fancy. General Thoughts RMAF isn’t really a show with much direct intersection with computer audio. Occasionally, a few relevant vendors will show and/or announce new products, but for the most part, attending RMAF is about experiencing mainstream audiophile systems. Also, it is a tough job to show a stunning system in a hotel room. In my experience - both last year and this time - I'd say less than 10% of rooms sounded even remotely good. However, I do feel this year was a little better. Of course, this is moot, as next year the show moves to a brand new venue, so we shall see if the ratio of good to bad changes. It’s all about people, people! Although the rest of this report will focus on my favorite sounds, the best part of the show is about meeting old audio friends and making new ones. Like last year, @limniscate (Eric) was my show buddy, and we visited most of the rooms together. Meeting CA’ers in person for the first time was certainly one of the highlights. Shouts out to @ted_b, @barrows, @The Computer Audiophile, @Rt66indierock, @Derek Hughes, and last but not least, @David.. Qobuz, Hi-Res Music Evangelist, with whom we had a memorable happy hour. I apologize if I missed any other CA’ers I met but forgot to list. Eric and I also hung out with Jay and Siao from Audio Bacon - great guys. Beyond that, there were spontaneous conversations with everyone from industry icons to fellow audiophiles throughout the show. Making and renewing friendships is truly the best part of these shows. Computer Audio Products While RMAF isn’t really focused on computer audio, one product did stand out: the new Innuos Statement Music Server (MSRP $13,750). It was showed in a system comprising QLN Prestige Three speakers ($9,999), LinenberG amplification, Aqua Formula xHD DAC. They had their previous flagship ZENith MkII SE (MSRP $7000) hooked up for A/B comparisons with the Statement. While the Statement is a massive uptick in price, you do get a separate PSU with 8 rails, OCXO clocks for USB and Ethernet, among many other improvements. The A/B experiment did a good job showcasing the SQ improvement with the Statement. Photo Credit: Well Pleased Audio Vida My favorite headphones of Canjam RMAF: Meze’s new Empyrean headphones ($3000) had a captivatingly smooth, dynamic, and spacious sound. I will definitely be giving this a closer look. Warwick Sonoma Electrostatics ($5000 with DAC/amp) were my favorite electrostatics after the iconic Stax SR009. Photo Credit: Abyss Headphones I enjoyed the new Abyss Diana Phi. When I first tried these a couple years ago, I found they had the clamping pressure of a vise on my admittedly large head. No more. This is one of many improvements in the Phi version. Photo Credit: Abyss Headphones One of my favorite headphones of the show was the Abyss AB-1266 Phi CC. Like its predecessors, the sheer slam and physicality of this bad boy, coupled with its neutrality and dynamics, make this a real flagship. These Quad ERA-1 planar magnetic headphones sounded very clean and smooth - reminiscent of Quad electrostatic speakers! - at the Woo Audio table at CanJam, driven by their diminutive but impressive solid-state WA11 Passport DAC/amp. Especially next to the just-released Focal Elegia closed-backs, which I found distinctly underwhelming. These Quad's may just set the new benchmark for the sub-$1k segment. Best sounding Rooms - Cost no Object I had loved the Nagra room last year, and this year again, it was one of my favorites. This year featured Nagra HD electronics, Nagra reel-to-reel deck, and Rockport Cygnus ($62,500). As you’ll read, Rockports seemed to find their way into several great systems at RMAF! Raidho’s room had these lovely TD-4.8 ($158-177k), driven by top-end Simaudio Moon electronics. The Vandersteen Model Seven MkII's ($62,000) with Sub 9 subwoofers ($18,000) and Granite upgrade ($10,000) sounded mighty fine, couple with VTL electronics. Constellation electronics driving Rockport Avior II ($38,500) speakers was another standout room. These $200k Von Schweikert Ultra 9s, powered by other expensive electronics, did one thing that too many other 6-figure speaker systems didn't do at RMAF - sound amazing. I visited twice, and was underwhelmed the first time they were playing Beethoven's 9th on a turntable. The second time was digital, and that was outstanding. These Wilson Benesch Resolution ($69,500) speakers really stood out with their pinpoint imaging. I was able to play some Mahler 10th from my own music, and it was an excellent system and sound. Another great-sounding room with Rockport Avior II speakers, this time with CH Precision electronics. Great Sound with Speakers under $20k It is easy to lose one’s sense of perspective and proportion at these shows. The prices on the best systems are, well, obscene. $100k+ speakers are commonplace, with preamps, amps each north of $50k. Heck, the aforementioned Nagra system had a DAC north of $50k. What madness! In order to showcase systems that were not insanely priced, I’ve placed more sanely priced speakers in this section. I focused on speakers, because some systems used really expensive electronics even with sub-$20k speakers - I guess because they could. Excellent sound from Canton Reference 3k speakers (MSRP $15,600), driven by electronics that were um, Esoteric-ally priced. Photo Credit: Legacy Audio Legacy Focus SE speakers (MSRP $13,975), driven by Raven electronics, impressed me with their fantastic imaging. Joseph Audio Perspective (MSRP $12,999) speakers on Doshi electronics. Another sanely priced speaker that sounded really nice. Good ol' Vinnie (Rossi). He sets up his rooms so well. And this year was no exception. LIO L2 electronics driving these Harbeth M40.2 Anniversary Editions (US MSRP $17,990) was really rocking. Room acoustics weren’t perfect, and I've heard this setup sound better at another show, but even so, the soundstage at the sweet spot was incredible. Speakers under $10k Raidho’s room alternated demos between the top end TD-4.8 mentioned earlier, and these Scansonic MB-5 (MSRP $7500) speakers. These sounded stunning at this price point! Just to highlight how show conditions matter - these GoldenEar Triton References (MSRP $8498) were sounding rather nice here, paired with Hegel electronics, unlike what I heard at AXPONA where I didn't like them. These Dali Callisto active speakers sound wonderful for the $5700 price point. I'm a sucker for the BBC LS 3/5A design. These Falcon units ($2195) sounded fantastic for their small size. This was one of my favorite rooms of the show! Falcon had a setup of 6 different generations of the BBC LS 3/5A, including a restored original BBC version, all the way to the latest version from Falcon. Listening to the same track switched between each generation was a real treat. I've got to say - these speakers are astounding, even to this day. And last but not least, my first exposure to the Wilson TuneTots (MSRP $9800). Very, very impressive sound. These would be killer for a nearfield setup - at a price! Other Interesting Rooms Here are some Spanish Maggies. Just kidding. These are AlsyVox full range ribbons and Omega electronics. Very nice. These German Physiks Borderland (MSRP $38,500) speakers sounded great. Only downside was it made my brain loop on "We are the robots" as long as I looked at them. Can we talk about the elephant in the room? Is that a giant horn or are you just happy to see me? These ESD Acoustic monsters were certainly worth a listen, if not my cup of tea. Plus listening to Chinese erhu music on these was a bit surreal. There seems to be no end in sight for the significant gains portable audio has seen in the past few years in terms of both sound quality and feature sets. The last big hurdle seems to tackle the elusive integration of tubes. A few desktop units from Woo Audio and others have trickled out into the market but a more portable solution hasn’t really gained significant steam in the public consciousness. Portland-based ALO has introduced several variations on this theme with their original Continental and subsequent Pan Am models, but has since halted production to focus on their new portable flagship called the Continental Dual Mono ($1,495). The feature set is a hefty one, and appears to be an impressive collection based on learnings and observations from the company’s time in the field. [PRBREAK][/PRBREAK] At first glance, the most obvious (and perhaps surprising) changes to the ins and outs is the inclusion of a 2.5mm balanced connection and the exclusion of the traditional 4-pin RSA port included previous generations. ALO’s amplifiers have always looked to complement the current lineup of portable players, so it may come as no surprise that the substitution has been initiated to correspond the current rise of Astell and Kern players. AK not only provides the source output, but also sells a two pairs of headphones for the receiving end of the chain; additional headphones may require an adapter. Other versatile niceties include a fixed 2Vrms analog output (3.5mm) for direct access to the included DAC section and both SE and balanced ins and outs on the front and back panels. The whole presentation is laid out extremely well and doesn’t skimp on the options. The previously mentioned DAC section can be tapped via a micro USB connection, charging capabilities are exclusive to the included 12.6V wall wart. ALO founder Ken Ball and his team pay careful attention to the current audiophile trends so it is no surprise that the CDM includes both DSD compatibility and an output impedance of less than 1 ohm on both the SE and the balanced headphone output. The front panel also includes 4 colored indicator lights to let you know what file resolution you are hearing as well as a 2-way gain switch for variable headphone output. As is the case with most amplifiers that feature both SE and balanced output, the balanced connection had more gain that its SE counterpart. As far as the SE headphone output is concerned, the total volume from the high gain stage might be a little light for loud listeners with extremely hard to drive headphones like the HiFiMAN HE-6. There was no issue driving my reference pair of Audeze LCD-3s or the HE-560s, but it was possible to drive the volume pot to its near maximum with quiet tracks (with the HE-560s). This gain appeared to be on par with the SE output from the AK240, but didn’t provide much additional muscle beyond that. This point is a small one, if even a null one when it comes to the overall appeal of the amplifier. Perhaps a subtle hint from the name, the intent of the Dual Mono seems very much wrapped up in the balanced connections and this becomes even more apparent in use. In broad strokes, the balanced connections are where the Continental really shines. In-ear monitors can be tricky to amplify in concert with full size headphones. They usually require separate amps to pull the best out of their corresponding partners. From the SE output the noise floor on low gain was relatively inaudible through sensitive IEMs (like the JH Audio Layla) and the volume sweep from low to high was extremely manageable. With the increased gain of the balanced output the 2.5mm connection of the Layla’s produced a very slight buzz. None of the amplifier’s outputs were plagued by any micro phonics or the dreaded “ting ting” sound (like a small pebble being throw against a glass jar) that can occasionally creep into tube amplification on this scale. The unit did warm up slightly during use, but kept surprisingly cool considering the encased tube design at play. There have been a few portable pieces that have entered the market that threw off incredibly high amounts of heat (most of which did not employed tubes) so considering the circumstances the outgoing temperature of the CDM seems very well done. Ken partnered with Vinnie Rossi of Vinnie Rossi Audio for the battery implementation and design. Power supply design is imperative to keeping amplification dynamic and clean, Vinnie elaborated on its application with the CDM: “The Continental uses a battery pack containing three of the Panasonic NCR18650 cells (same as used in the Tesla Model S) connected in series for a 11.1V nominal battery pack. These are known as the finest 18650 Li-ion cells on the market. The battery pack (and tubes) are user-changeable. What makes the CDM's implementation special is that we are not using a step-up transformers or DC-DC converters for the tube stages. We feed the clean power from the battery pack directly to the tubes' B+ (anode) and achieve remarkably low noise floor and microphonics for a tube-based amplifier. As far as I know, CDM is the only portable tube amp/dac that is all linear-voltage regulated. Therefore, we were able to meet our goals of getting a good taste of ALO's reference amplifier The Studio Six, in a portable package and at a much lower price point.” While some audio items don’t vary much with playback exposure, the CDM sample I received did change slightly with a burn in period. The mids opened up and leveled out and the overall presentation picked up quite a bit from the initial plug in after a few days of use. Once a balanced playing field was achieved, it became easy to visualize suitable applications for the new flagship. Partnering with an AK device became an interesting proposal. The AK240 ($2,499) isn’t the cheapest player on the market, but it comes packed with a real pretty sound. Through the player’s 2.5mm balanced output via ALO’s SXC 24 cable, the Dual Mono added just a hint of tube to the mix. The stock tubes that come with the amp are a pair of new, old stock Phillips military 6111s. The resulting sound is delightfully linear and refined from this glass. The mids round out just a hair and the bass stays tight and doesn’t get even slightly mushy. It’s a very interesting and appealing approach for those who are adverse to intense tuby-ness. For those who love an even fatter sound, tube rolling is an option. Ken has experimented quite a bit with different combinations and a significant range of alternatives is available directly from ALO’s site. According to Ken, the stock tubes lean on the light side of “Tube-ness” scale while many others take a deeper dive. To my ears the stock tubes hit the sweet spot perfectly. The CDM is even auto biasing to make the rolling process more user accessible. You can see Ken explain the process in more detail here: While the CDM’s single ended side is both transparent and linear, I found myself drawn to the balanced connection’s texture and range. If you are willing to put down the funds to get this amplifier, I highly suggest you invest just a little more in your headphones and take advantage of the balanced output. The dual mono configuration really shines in this implementation. Even IEMs appeared to take advantage of the situation. The JH Audio universal fit Laylas sounded exceptional when listening to the 24bit/192kHz version of Cat Steven’s Where Do The Children Play?. Vibrant and dynamic, the Continental did an amazing job of creating an organic sound while maintaining a clean window to see through. The Laylas do a top-tier job of creating an out-of-head experience for the restrictive in-ear driver technology. Through the CDM the organ sounds from the track sounded even more precise and natural, a very healthy acoustic combination. While the amplifier allows for SE and balanced crossover headphone to source, full size headphones appear to see a slight benefit from keeping with the same type of connection, and between the two a fully balanced setup end-to-end again appeared as a preference. An A/B between the AK240 source produced no frequency anomalies, although some tinkering can most likely be achieved with tube rolling. The CDM masked no detail. While still a great performer for the price, the $500 AK Jr, doesn’t quite have the resolving power of its bigger brother. Through its SE line out connection, the amplifier section of the Continental remained true to the source with no artificial sweeteners or preservatives, just a mild injection of the previously mentioned well-placed hint of tube. Compared to the AK Jr’s headphone output the advantage of CDM is even easier to pin point. Expanded soundstage, a more delicate dimensionality - the entire presentation feels enhanced with increased levels of energy and dynamics. The digital section of the unit is driven by a Wolfson 8741 chipset married to a latest-gen CMedia 6632A USB interface. The connection requires a driver install for DSD usage to a MAC, but all other Apple interactions are driver-free. This includes connectivity for lighting-based iDevices. Both an iPhone 6 Plus and iPad Air worked perfectly out of the gate via a lighting to USB camera adaptor with no additional fuss. From ALO’s site: “We selected this chip after extensive examination of all available reference DAC chips. The WM8741 has exceptional signal to noise ratio and extended dynamic range. It also provides low noise, low distortion and superior linearity. The Wolfson provides high-resolution DSD and PCM playback and offers musically compelling digital filters. WM8741’s minimal phase digital filter is more natural sounding because it has no ‘pre-ringing’ of its impulse response. Just as a piano doesn’t produce sound before a key is pressed, the minimal phase filter doesn’t ‘pre-ring’ its impulse response.” At the market matures around audio DAC chipsets, it seems manufacturers are looking beyond the ESS SABRE 9018 for more natural presentation and easy implementation/programing. The multi-platform compatibility here is a nice touch. The size and heft (not to mention the use of tubes) would probably prevent a consumer from strapping the CDM to an iPod and putting it in a pocket, but its Walkman tapedeck shape is wildly appropriate for any desktop solution. It is portable and can be easily moved, but I wouldn’t recommend just throwing it around like you would a phone due to the tubes. Comparing the digital section to Auralic VEGA ($3.5k) produced interesting results. The much higher price of the VEGA isn’t quite a fair cost comparison, but those extra dollars do an excellent job of manifesting themselves as natural, lived-in musical reproduction. The comparison here revealed much of the same. The VEGA was whimsical with a softer edge but made the already solid digital/analog pairing even more believable. The 8741 gets high marks for resolving power and musicality on its own. The overall feeling of the chipset seems to be in line, if not a step forward from most digital sections in amp/dac combinations that have made it to market in recent years. There were absolutely no aberrations in frequency response that could be pinned on the Wolfson and the level of detail was very impressive. Bonus points to ALO for including a line out to tap into a full stereo or another headphone amp, a feature that seems grossly overlooked in the portable sector. At $1,495 the Continental Dual Mono is the most expensive portable amp/dac combo I have ever reviewed. But with portable players beginning to hit the $3.5 mark the move seemed almost inevitable. It adds just the right amount of fun to the mix without ever being overbearing or colored. It is feature rich in all the right places and leaves very little else on the table. The included stock tubes feel right on the money but allow for tube rollers to fine tune the device to their heart’s content. If the CDM falls in your price range suit up, grab yourself a pair of respectable headphones and lose yourself in the music. The best is only going to continue to get better. Image Gallery [ATTACH=CONFIG]19905[/ATTACH][ATTACH=CONFIG]19914[/ATTACH][ATTACH=CONFIG]19903[/ATTACH][ATTACH=CONFIG]19910[/ATTACH][ATTACH=CONFIG]19904[/ATTACH][ATTACH=CONFIG]19911[/ATTACH][ATTACH=CONFIG]19907[/ATTACH][ATTACH=CONFIG]19912[/ATTACH][ATTACH=CONFIG]19906[/ATTACH][ATTACH=CONFIG]19913[/ATTACH][ATTACH=CONFIG]19908[/ATTACH][ATTACH=CONFIG]19909[/ATTACH] [ATTACH=CONFIG]19916[/ATTACH][ATTACH=CONFIG]19917[/ATTACH][ATTACH=CONFIG]19918[/ATTACH][ATTACH=CONFIG]19915[/ATTACH] Product Information: Product - ALO Audio Continental Dual Mono DAC / Amp Price - $1,495 Product Page - Link Associated Equipment: Source: MacBook Air, Astell and Kern Jr., AK240, iPhone 6 Plus, iPad Air DAC: Auralic VEGA Headphones: Audeze LCD-3, HiFiMAN HE-560, JH Audio Layla (Universal), JH16 (Custom), Beyerdynamic AK T5p Playback Software: Audirvana Plus, iTunes Cables: AudioQuest Victoria, Zu Mission RCA Mk.II-B, ALO SXC 24 2.5mm to 2.5mm balanced Where To Buy: Addicted To Audio (Australia) About The Author Brian Hunter I’m a recovering musician turned audio reviewer. I currently manage and write reviews for Audio-Head.com and freelance with several other publications. I love tech and the tools of music, especially the ones involved in reproduction. After I finished my undergrad degree in business I went to the local community college and got one in photography, which was way more fun. I like it when people have unbridled enthusiasm for something and I have the utmost respect for individuals who try to create, even more for those who are good at it. The Oppo HA-1 is a harvester of many tricks, so many in fact that it is almost unfair to label it strictly a headphone amplifier as the acronym in the name suggests. It really stretches the boundaries of inputs, outputs and digital conversion all within a reasonable amount of desktop real estate. As with all things Oppo, attention to detail appears to be a top priority, even down to the packaging. In a market where the focus on sound quality can allow manufacturers to slip by with off-the-shelf interfaces and external design, the Oppo ship is watertight. In rare form for most HiFi equipment, the head amp includes a fully interactive graphical interface, complete with pretty icons for source selection. Connectivity is king with the HA-1. Nearly every single base is covered. In the rear you can find super DSD-friendly USB, single ended ins and outs, balanced XLR ins and outs, and one of each type of available digital input (including optical, coaxial and AES/EBU). To top it all off Oppo included both an in and out trigger and Bluetooth connectivity with aptX. An external remote is included, but in case you don’t want another one lying around the house, Oppo even has a remote app for your perusing pleasure that connects via Bluetooth. [PRBREAK][/PRBREAK] The front panel has a standard ¼ inch headphone jack, 4 pin balanced XLR for headphone and USB input for iDevices. It’s practically a new gold standard for headphone amps that has yet to see an equal. 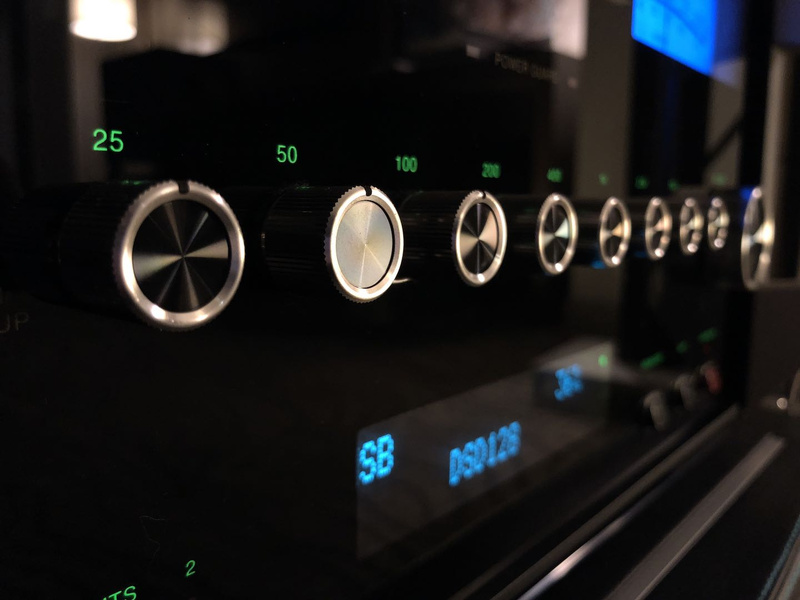 In truth, Oppo could have likely gotten away without the head amp section and charged the same, if it weren’t for its highly regarded BDP-105 Blu-Ray player whose feature set and price overlap with the HA-1. If we were to look at the HA-1 through a lens of personal audio the only thing that is missing is a dedicated 3.5mm headphone jack for IEMs, like the one found on the new WA7d by Woo audio. While running the amp through the paces the ¼ inch jack did display just a very slight hum through the ultra sensitive JH Audio JH16s (the 16s do come in lower than the recommended impedance of 32-600 ohms for the amp). The upswing is that volume control was delightfully distributed, even for IEMs (allowing for a nice gradual increase that peaked around 11 o’clock) and the hum wasn’t really audible at all while music was playing. All in all the HA-1 still gets the check box approval for IEMs. Simply tapping into the USB Apple connection on the front panel with the JH16s noticeably cleaned up the sound when compared to the plugging directly into an "old" 6th gen iPod Nano’s headphone output. The rated output impedance for the class A amplifier is an impressive 0.5 Ohm and 0.7 Ohm for both the balanced and SE connections respectively. The 4.3 inch display screen features color, but is not touch sensitive. The menu is easily navigated via push-capable source selector knob. Simply rotating the knob brings up the previously mentioned "pretty" icons indicating the source, of which there is an applause-worthy eight in total. Pushing deeper into the menu allows you to pick from three pre selected home screen display setups, two of which animate while music is played through the device. The "VU meter" option pays a little homage to the McIntosh look, while the "Spectrum" home screen makes for a pretty fun, visual frequency representation. Like the BDP-105, the 13 lbs. HA-1 is very heavy for its size. Fit and finish is simply outstanding and puts many higher priced audio products to shame. The connectors in the back feel very secure against the back panel and do not wiggle or feel loose when applying cabling. The box itself has a nice shape to it and even though it is a bit deep, most users should be able to find enough space for it on a standard sized desktop. Some of that extra weight no doubt is a contribution from the toroidal power supply. 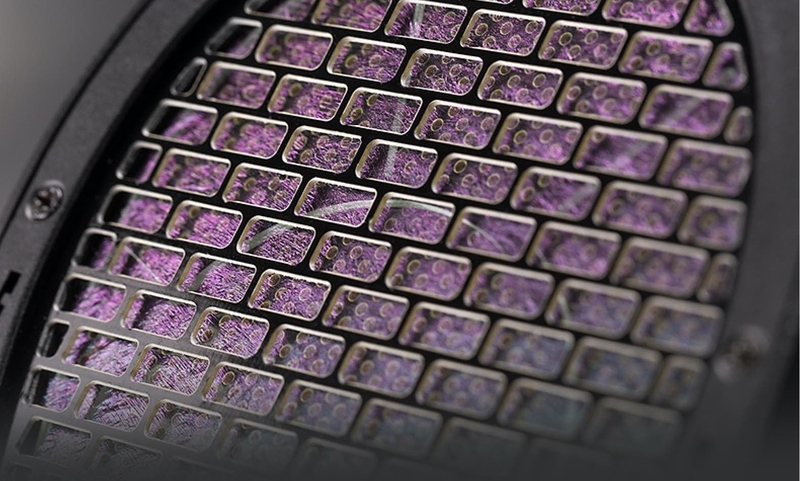 From the Oppo website: "A toroidal power transformer offers superior power efficiency and much lower exterior magnetic fields over traditional laminated steel core transformers. The HA-1's toroidal linear power supply provides a very clean and robust power source to the audio components." Even though it may be inconsequential to some audiophiles, its worth mentioning that the power cable that comes with amp is one of the beefiest I’ve ever seen packaged with a piece of audio equipment, a fine testament to Oppo’s value proposition. The volume control knob offers up a fair resistance when turned and feels solid to the touch. While the on board screen suggests a digital volume control with another pretty animated graphic, Jason Liao from Oppo cleared the air with regards to the potentiometer. "The volume control in the HA-1 is purely analog. One of the design goals of the HA-1 is to keep the signal in analog domain once it leaves the DAC. Since the HA-1 is a fully balanced design, we use a 6-gang precision potentiometer part for the volume control. Each left and right channel is controlled by 2 gangs of the potentiometer. We use the fifth gang for sampling the position of the knob so we can display the approximate volume level on the LCD screen. The potentiometer has a motor-driven mechanism so it can be remotely controlled via IR remote or Bluetooth app. A nice feature of the motorized volume knob is that when you change the amplifier’s setting from NORMAL gain to HIGH gain, the HA-1 will mute the audio, turn the volume knob to reduce it to a safe level, and then un-mute. This can greatly reduce the surprise when someone changes to HIGH gain and gets a loud sound." Among the many inputs of the HA-1 lies another interesting add on for a head amp, Bluetooth. The tech requires the addition of included external antenna, but the small piece barely peeks out from behind the amp and extends the range to an admirable distance. The application is threefold. Pair with a computer or smartphone as a source, pair with a Bluetooth-capable headphone as an output and pair with a phone/tablet as a remote control. The HA-1’s Bluetooth is 2.1 +EDR and supports both the SBC and buzz worthy aptX audio transmission formats. Switching between the über resolution of the USB connection and Bluetooth revealed an unsurprising slight loss of dimensionality, but was still surprisingly adequate for a quick connection from a mobile source in a pinch. The coinciding "HA-1 Control" app for smartphones provided a pretty seamless extension onto the OS. Volume control, input selection, mute and up/down track selection all worked without a hitch, but the BT connection did suffer a small quirk. Bluetooth connectivity is powered off when the head amp is powered down so you can turn off the HA-1 from a phone, but not on. The app makes you aware of this by closing down completely after tapping the orange power button from within the software. You need to manually turn on the amp before restarting the application. Overall the user experience with the app is straightforward and practical. The volume control physically rotates the knob on the unit and even displays the current dB level remotely. The main silicone pushing conversion duty is the popular ESS SABRE 9018. The digital section of the HA-1 operates like a 9018 with proper implantation, which is to say it sounds pretty darn spectacular. The overall effect is pleasantly transparent, especially considering the going price for the amplifier. Plenty of top end air, excellent extension on both ends and a fine, crisp resolution mark just some excellent highlights of the "ESS patented 32-bit Hyperstream™ DAC architecture and Time Domain Jitter Eliminator" ES9018 implementation in the Oppo. The included asynchronous USB connectivity is now becoming a bit of a standard feature for almost any up-to-date DAC, but DSD compliance isn’t quite there yet. The HA-1 does allow for playback of DSD64, DSD128 and even DSD256 if you happen to cross paths with a file that requires it. There is perhaps a slight edge to the sonic retrieval, favoring detail over organic delivery, which became more apparent when comparing to the higher priced Auralic VEGA. For nearly 3Xs the price and sans head amp, the VEGA was able to add a subtle layer of naturalness to the equation, but the much of same coveted ES9018 house sound could be found in the HA-1. As the Oppo DAC was put through the paces, it was increasingly impressive how well it scaled up to the occasion. Dedicated amplifiers like the Questyle CMA 800R and Auralic Taurus really swung out under the influence of both the SE and balanced output feeds. The soundstage from the DSD version of Norah Jones Turn Me On makes for a fairly impressive headphone demo. The organ sound through the HA-1’s balanced outputs was so spicy it almost felt like you could reach out and wave your fingers though the fluttering sonic tapestry it painted. The front and center vocals appear with plenty of virtual air and space to separate them from the rest of the well-placed instruments. The tonal sum here still nods in the direction of BDP-105’s composure but is housed in a much smaller suitcase. Most of the critical listening of the headphone amplifier section of the HA-1 was done through the 4 pin balanced headphone output on the low gain setting. The headphone sample used included both Oppo’s matching PM-1 planar magnetic headphone and the Audeze LCD-3 as a reference. Balanced output from end-to-end was definitely top of mind when the HA-1 was designed. "The internal analog audio signal path of the HA-1 is fully balanced. For digital audio, the signal runs in balanced mode all the way from the DAC to the output jacks. Balanced analog input is kept intact, and single-ended input is converted to balanced at the input buffer. All single-ended outputs are derived from the balanced signal as well. The balanced design provides better common-mode noise rejection and improves signal quality. The balanced headphone output provides twice the voltage and four times the power of the single-ended output, enabling the HA-1 to drive the most power hungry headphones. It also provides better channel separation by eliminating the common ground return path." There is a timbre richness to overarching sonic texture that accompanies the amplification stage. Samples cut from the balanced line outs confirms it existence, but also reaffirms that its impact is only slight. While this sonic affluence may be polarizing for some, those with a taste for texture will find the signature right at home. The response remains strongly linear, focused and very easy to listen to. Dynamic response, low-end impact/extension hit hard and fast like a well-oiled solid-state amp should. Oppo makes it easy to see why the HA-1 is so much more than just a simple headphone amplifier (although it can be easily isolated and utilized via the SE and balanced inputs). With both single ended and balanced outputs in addition to a wide cross section of source capabilities it is a virtual Swiss army knife of head amps. Perhaps one of the overlooked extensions of this metaphor sits quietly under the volume knob. The USB iDevice connection really brought out the best from iPods with a deliberate and discernible improvement. Jam packed with features, the HA-1 holds a nearly endless supply of applications to improve your desktop listening. Summary From a straightforward up-to-date techs-and-specs position the Oppo is currently unchallenged at its price point. It is a features-driven product with spectacular results. It is so much more than a headphone amplifier in the same fashion that an Oppo player is so much more than just a Blu Ray transport. Innovation, durability, flexibility and enough connectivity specs to make your head spin give this little contender both its charm and its value. Its on hand compatibility paired with a sleek digital side makes it one of the most complimentary components for desktop listening in the sub $2000 range. [ATTACH=CONFIG]13412[/ATTACH] [ATTACH=CONFIG]13413[/ATTACH] [ATTACH=CONFIG]13410[/ATTACH] [ATTACH=CONFIG]13411[/ATTACH] Product Information: Product - Oppo HA-1 Headphone Amp & DAC Price - $1,199 Product Page - Link Associated Equipment: Source: MacBook Air DAC: Auralic Vega Headphones: Audeze LCD-3, Audeze LCD-XC, JHAudio JH16, Oppo PM-1 Amplifier: The Calyx Integrated Loudspeakers: Zu Soul MkII Headphone Amplifier: Auralic Taurus MkII, Questyle CMA 800R Playback Software: Audirvana Plus, Decibel Cables: Zu Mission RCA Mk.II-B, Wywires Silver About The Author Brian Hunter I’m a recovering musician turned audio reviewer. I currently manage and write reviews for Audio-Head.com and freelance with several other publications. I love tech and the tools of music, especially the ones involved in reproduction. After I finished my undergrad degree in business I went to the local community college and got one in photography, which was way more fun. I like it when people have unbridled enthusiasm for something and I have the utmost respect for individuals who try to create, even more for those who are good at it. As a follow up to the recently released Auralic VEGA Dac, designer Xuanqian Wang decided to give his Taurus balanced headphone amplifier a refresh with the newest MkII revision ($1,899). The new version employs the same silver minimalist stylings as the VEGA and allows for both single ended and balanced headphone connections. As an added bonus he chose to include a pair of SE and balanced outputs, so the Taurus MkII is free to take on pre amplifier responsibilities as well. I am a big fan of the VEGAs design and build. The entire unit felt well kempt and detail-oriented. Likewise the Taurus is solid from top to bottom. While the 3 legs its chassis rests upon is designed to reduce vibrations from entering the component, plugging cables in to the back turned out to be slightly more prone to tipping left or right than the conventional 4 leg setup. Minor quibbles aside, everything works as it should. The Taurus runs though the courses with the expected panache of the full high-end experience. Its relatively heavy weight convinces you its innards are chock full of lovely audiophile-oriented components. Indeed, the size is the same as the VEGA, which was a fine choice by Wang. The chassis still large enough to be taken seriously (especially for a solid state head amp), but not so big that it takes up two parking spaces on the precious real estate of your desktop. It even makes a fine visual pairing with the Macbook Air I reviewed it with. Similarities between the two are easy to spot, the finish bears a close resemblance to the recognizable laptop line and the footprint is almost exactly the same. [PRBREAK][/PRBREAK] While not as quite as smooth to turn as the VEGA’s knob (which augmented the volume purely in the digital domain), the Taurus’ analog adjustment shares the same understated half-an-egg look and feels both deliberate and consistent to the touch. The volume sweep from low to high was well distributed and didn’t jump too quickly to louder listening levels. Both the singled ended ¼” and four pin XLR balanced jacks are tucked neatly into the front panel. The accompanying input and output switches keep things simple and direct. The “BAL” setting on the output toggle adds just bit of gain to the equation over the unfortunate acronym “STD” (for standard) unbalanced setting. Wang elaborates on these two modes, “BAL mode is true balanced driving (bridged driving, aka BTL). The STD mode is the typical singled-ended driving mode, even if you use the 4 pin balanced output. The input method does not affect the output mode. You can use a RCA input and still take advantage of the BAL output, the internal circuit will transfer the single-ended input signal to balanced one and drive the headphone.” The semi gloss black back of the unit features a fine array of input and output choices all clad with connections that feel like a step up in quality. While many of the headphones I had on hand sounded outstanding through the Taurus, I found a nice synergy with the Audeze LCD-3 headphone. In fact, Wang let me know that this latest version even included a few new updates to help optimize performance for headphones like the LCD-3, including modifications to the input buffer circuit to insure lower noise levels. If nothing else, the four-pin XLR connection choice by Wang certainly allows for easy stock cable pairing with the Audeze headphone. The overall power driven through the amp is adequate for even the toughest to drive cans (2000mW into 300 ohms balanced). In BAL mode, the amplifier allowed for normal listening at a mere 10 o’clock. While a balanced configuration doesn’t always carry the same impact in every setup, I did find its implementation with the LCD-3 to be preferable over the SE connection (and STD setting) from the Taurus. I noticed more upper air and an even wider soundstage to set the music upon with very little else sacrificed in the transition. The 24/96 Fleetwood Mac classic Dreams features an identifiable high hat sound that hangs tenaciously in the right channel. The balanced connection created a sensation that swung this instrument sound further out than its SE counterpart. Any improvements to get the sound out of my head and placed more eloquently in front of (or around) me is always a welcome change when it comes to headphone listening. Switching the output switch back and forth between BAL and STD mode garnered even more subtleties on the low end. BAL produced fuller bass presentation and perhaps even a larger emphasis overall. Nothing even remotely close to a “boost”, but rather a simple, eloquent elaboration of the bottom frequencies. Through either mode frequency response was as uniform and smooth as you would expect from an upper tier solid-state amplifier. Highs ring true with a natural transparency and are not overtly shrill or colored. The low end was equally impressive. Though a somewhat peculiar song overall, Hella Good by No Doubt has a very engrossing and interesting bass section at the start of the track. On lesser systems, much of the detail that is available within this frequency band section can be missed. Not merely a test of extension and fullness, the unique texture of the bass sounds provides even more insight into your systems presentation and capabilities. The Taurus did an outstanding job of translating this information. Fullness and texture rang true to form. I found myself really enjoying the bass shape and reach throughout my listening sessions. Amid the monstrous low-end gravity, I was still able to clearly identify the intricacies of the scratchy overtones that accompany this section. The Taurus faded into the woodwork (in a good way) across many of the genres I threw at it. Simple, transparent and not overly boastful at any frequency, music flowed eloquently through the device with relative ease, making headphones pairings a bit easier. Still, I stuck with the LCD-3 for most of my evaluations as it was one of my preferences in a balanced setup from the Benchmark DAC2 D I used as a source. Through the Taurus, headphones were able to deftly deliver less of a “canned” sound and earned full marks for naturalism. Wang went into further detail on the tech of the amplifier; “The ORFEO output module makes a substantial contribution to the sound of the Taurus as it is a class-A design. By utilizing a mass number of small power components rather than one big one we were able to deliver better linearity with lower distortion and also allow for bigger output power at reasonable size. We also implemented an ultra-low noise high input impedance buffer circuit, which helps pass more of the musical detail from the recording to your ear.” Detail was present and accounted for. Imaging was sharp and focused as any amplifier in this price range and trickled down into the naturalness of the whole listening experience. The recorded sounds from drum kit tom toms are fairly difficult to reproduce with any sense of realism. Perhaps one of the most overlooked pieces of percussion, I find their sound to vary quite a bit upon playback, marred by flat, generic or odd tone. Toms are usually overpowered by everything else going on, and their rather infrequent use isn’t going raise them as a priority production element any time soon. At the end of the day, these filler drums rarely sound the same in recordings as they do when you sit behind the kit. That being said, I did feel the Taurus helped this “second tier” drum situation course correct a bit. Drum fills across the board felt slightly more dimensional and true to life. If a quick accent popped up, the dynamics remained more intact. When a tom fill sped across the soundstage from right to left, its arc felt wider and more luxurious in its travels. As I listened to the Doors Love Her Madly it was easy to pick out each individual instrument from the stereo field. John Densmore's drums are set just to the right side of center within the track. While not panned nearly as far as the early Beatles recordings, its virtual location was easily determined and yet completely separated from Ray Manzarek's tell tale organ across the clear, intentional sonic stage. Everything was laid out beautifully in the field for all to see. I even discovered an understated tambourine section during the chorus I hadn’t noticed before. The location of instruments (including Morrison’s voice) was precise and focused. Unruly clarity and distortion can rob music of its dimensionality, like peering at a mailbox through cloudy window with one eye. The Taurus did an excellent job of evading such pitfalls. Through the amplifier music appeared as it was intended, where it was intended. As a pre amplifier the Taurus performed admirably. I introduced the unit into my loudspeaker setup between my Oppo BDP-105 source and Calyx Audio Femti power amplifier (as opposed to running the Oppo direct to the Calyx). Relative dynamics and responsiveness improved in a similar fashion to the Auralic VEGA's performance as a pre amp. While the lack of remote (for the Taurus) makes it an unlikely scenario for a full size rig, those adventurous enough to employ an array of desktop loudspeaker components may find use of it. As far as dedicated headphone amplifiers go, the Taurus is a versatile piece. Its balanced options and affinity towards the Audeze LCD-3 make it a must-try if you already own the headphone. It’s presence is comprehensively subtle, but engaging none-the-less. The amplification it supplies is accented by firm bass, a wide stage and accuracy with very little external coloring. While amplifier options at this price point start to broaden, the Taurus keeps up with expectations. The simplistic external design and build is equally as impressive as the svelte matching VEGA DAC and the overall sonic experience is just as enjoyable as its digital brother. Backed by a well-rounded source, the Auralic Taurus would make a fine supplement to an audiophile’s desktop rig. Taurus MKII Gallery [ATTACH=CONFIG]7899[/ATTACH] [ATTACH=CONFIG]7896[/ATTACH] [ATTACH=CONFIG]7900[/ATTACH] [ATTACH=CONFIG]7897[/ATTACH] [ATTACH=CONFIG]7902[/ATTACH] [ATTACH=CONFIG]7898[/ATTACH] Product Information: Product - Auralic Taurus MKII Balanced Headphone Amp Price - $1,899 Product Page - Link Where To Buy: Audio Philosophy Associated Equipment: Source: MacBook Air, Oppo BDP-105 DAC/PreAmp/HeadAmp: Benchmark DAC2 D Additional Headphone Amplifiers: Woo WA6SE, ALO International Headphones: Audeze LCD-3, Sennheiser HD650, Sennheiser Momentum, JHAudio JH16, Grado SR80, V-Modo M80 Amplifier: Calyx Femti Loudspeakers: Zu Soul MkII Playback Software: Audirvana Plus Cables: AudioQuest Victoria, Custom JE Audio Design Cables About The Author Brian Hunter I’m a recovering musician turned audio reviewer. I currently manage and write reviews for Audio-Head.com and freelance with several other publications. I love tech and the tools of music, especially the ones involved in reproduction. After I finished my undergrad degree in business I went to the local community college and got one in photography, which was way more fun. I like it when people have unbridled enthusiasm for something and I have the utmost respect for individuals who try to create, even more for those who are good at it. For those not familiar with Woo Audio’s offerings, the USA-based company has been making high performance loudspeaker and headphone amplifiers for several years out of New York. Owner Jack Woo has successfully piloted the company and built a substantial reputation for quality-made tube stage amplifiers. While the full product rundown includes loudspeaker implementations, most of Woo’s foothold in the marketplace comes directly from its large, perfectly incremental headphone amplifier product line. From their entry level single-ended OTL WA3 amp ($599) to the behemoth WA234 monoblocks ($15,900) Jack and the team have a little bit of something for everyone interested in analog listening. Keeping up with the times requires a bit more than just creating price touch points across a scale. The newest version of the WA7 Fireflies firmly addresses these changes in technology while also tapping into that elusive harmony which happens when the digital and analog realms collide. The two-part package starts at a cool $999 for the WA7 with a solid-state power supply by itself, with the WA7 tube power block costing an additional $749. Bundled together however, you will be able to save a little bit of scratch as the full tube package purchased at the same time will cost a mere $1,599. [PRBREAK][/PRBREAK] Both the solid state brick and matching tube cube attach themselves to the back of the main WA7 unit via a DC input port located on the back panel. A further inspection of this rear faceplate reveals why this new product is the interception of new and old. One of the first Woo products with an internal digital section, the new WA7 also receives USB input up to 24/384kHz. A pair of single ended RCAs can be found in close proximity to the digital port, and cleverly doubles as both an analog input and as an analog output for the USB connection. A three-way switch allows you to toggle between the USB/RCA inputs and analog outs. There is a two level low/high gain switch as well as a power toggle, however, if you purchase the WA7 the mirrored round knob on the front of the power supply also acts as an on/off switch when pressed in, but lacks a function for its rotational capabilities. When activated, the WA7 presents itself with a very satisfying glow from the four tubes that sit on top of the cubes. The main amplification of this desktop digital combo is pure tube class-A topology (with no semiconductors in the amplification path) and comes stock with a pair of matched Sovtek 6C45 glass for the main amp and RCA 5963 NOS for the tube power supply. Woo also sells additional tube upgrades direct from their site, and the amplifier is of course susceptible to all matter of tube rolling options that add an additional layer of customization to the hobby. The Sovtek 6C45 triode assumes both driver and power tube responsibilities. Perhaps one of the most eye-catching features of this combination amp/DAC is the solid block of glass that sits atop both boxes that allows the tubes to remain delightfully visible while providing a protective shell of sorts against random collisions for the tubes. The fully transparent block is striking and adds to the overall design in a very interesting way. It is important to note that the block does indeed rest on the unit and is not secured to the surface in any manner. It didn’t prove to be an issue during use, as general care is very much recommended whenever hot external tubes are employed in the design of an amplifier. The glass blocks did manage to do a significant job in dispersing the heat generated from the tubes. The lower section warms up a little as expected, but the top of the glass remains relatively cool to the touch. The WA7 comes together with an appearance that resembles a perfect cube, which proves to be a very pleasant design element to its overall cosmetic appeal. Its art-ish sensibilities do a great job of bringing something more visually to the desktop, without overdoing it. Like all things Woo, it is quite heavy for the size and feels durable against the elements of time. Even the little rubber feet on the bottom of each unit feel secure, while still responsive enough to absorb vibrations in proper form. There are two single ended headphone connections located on the lower right corner of the main amplifier unit. While the ¼” output may act like your typical full size audiophile headphone jack, the 3.5mm does not. Woo provided some more light on the subject: “The 3.5mm is designed for extremely sensitive IEMs, specifically made to deliver an ultra-low noise floor for these type of earphones. The 1/4” output is for all other headphones (8-600 Ohms).” In execution the 3.5mm did complement a pair of JH Audio Layla IEMs very well by allowing for a more even volume sweep with a reduced chance for low-level channel imbalance. The jump from no volume to ear bleeding can be frighteningly thin when it comes to sensitive IEMs plugged into full size amplifiers. The extra layer of security here was a welcome one in this scenario. So what makes this new version of the WA7 different than the previous iteration? According to Woo there have been several updates, including a new “high-resolution audiophile-grade DAC, improvements to the voltage regulator and the DAC is now powered by a linear PSU for better performance. There is also a new OP amp output stage, improved analog circuit, Teflon tube sockets, high-retention USB connector (orange color) and enhanced tube glow.” Specifics on the new choice of silicon boiled down to the SABRE ESS 9018M for digital signal management. “We tested many DAC chips, USB controllers and circuit designs. The ESS 9018M with XMOS controller sounded most musical. The new DAC supports Hi-Res up to 24/384kHz and is iOS/Android compatible with appropriate adapter, previously it was 32/192kHz.” The digital section indeed feels very 9018. While the chipset can vary quite a bit upon implementation, there is a mild consistency to the sound, if it is done correctly. Some high priced standalone DACs have been known to push the 9018 series even further, but its commonality in portable amp/DAC combinations as of late raises its frequency in the wild to near “everyday” values which help push the new benchmark for performance even higher than it was just a few years ago. The same holds true with the WA7, it is well executed and clean. No significant missteps in the transfer and no driver needed for connecting to my Macbook Air. Utilizing Audirvana Plus it was easy to select the DAC as the preferred audio device from the preferences menu. The digital connection showed up as “xCORE-AUDIO Hi-Res 2” and played succinctly without any further issue. The USB input comes off detailed and accurate with the tube section of amplifier rounding out the sound in an agreeable fashion. Comparisons to the more premium priced Auralic VEGA ($3,499) from the unbalanced inputs highlighted the organic and natural presentation the VEGA is known for, but put up a good fight in terms information retrieval and firmness. Overall the digital section feels accurate and on point for any 9018 in this price range. Given the output capabilities (which are surprisingly rare with these type of all-in-one units) additional value is piled on top of an already solid digital conversion story. The house sound of Woo has always managed to avoid a Goldilocks scenario with regards to “how much” tuby-ness it seeks to employ. The bed it chooses to lie in always supplies the right amount of warmth without leaving the mids too loose or allowing the low end to get destroyed in a grand wave of slushy softness. The “sweet” sound is there with the WA7, but it’s not in your face waving its hand wildly for attention. The subtlety of it all drives your music with a pleasant demeanor, one that can often counter-balance the directness of the room-less headphone listening experience. Listening to the 24/96 version of Jason Mraz’s Everything is Sound provided a very open representation of the fairly dynamic and varied track. The vocals to the introductory verse sounded robust and textured with a pleasing timbre. As the first signs of the backing band appear in the track, it was easy to pick out the left and right stereo location of the keyboard (right), organ (left), guitar and sax as they jumped around in the sound field. As the bass enters the scene the overall appeal leans to a more smooth presentation that is very easy to listen to. It is equal parts relaxed inspiration and dynamic stability that provide much of the allure to the analog-inspired sonic portrait of the WA7. Vocals arrive in a balanced contribution to the picture, falling neither back nor too far forward against the rest of the spectrum. Bass response is clear and never overcooked and the treble doesn’t take on any additional screech or sibilance during the amplification process. The extension upward feels natural and airy. Cymbals don’t sizzle or crackle at loud intersections but rather communicate a more buttery aggregation of high-end sonics during energetic passages. From end to end the 9018 provides a nice platform that complements the traditional Woo prowess of amplifier construction. In/out rights from the analog RCAs maximize the feature set while keeping real estate to a minimum. The external design of the WA7 looks like a thousand bucks, which is convenient considering the going rate for the solid state option falls closely in line with the sentiment. Its easy to say that any design elements that deviate from the norm cause the populace to pick sides, but in the case of this Woo unit most will likely agree that its break from the masses is one for the better. Talk piece combined with audiophile analog traits make the all-in-one unit a fine complement to any upscale desktop or the top shelf of your audio gear rack. If you are a fan of Woo gear already then trust this newest addition to the family puts a fine digital foundation behind the house sound of the company. It appears that a lot of thought has gone into implementing the proper combination of in/outs/features for Woo’s resurging everything-in-a-box. Certainly one of the highlights is the forward thinking dual headphone output, carefully prepared for the headphone that is most likely to utilize the jack size. The overall size of the WA7 is big enough to be taken seriously, but not so much that seriously takes up space. Tonality from the device is a reasonable extension of company’s origins but picks up the latest updates to stay current with market trends. Its packed with enough power to drive all the latest headphones to sufficient levels without a hint of strain, but yet is also capable of delivering music that is free of hard edges while remaining significantly true to the original source material. The WA7 Fireflies is a tight package on many fronts. Image Gallery [ATTACH=CONFIG]24906[/ATTACH] [ATTACH=CONFIG]24913[/ATTACH] [ATTACH=CONFIG]24910[/ATTACH] [ATTACH=CONFIG]24907[/ATTACH] [ATTACH=CONFIG]24911[/ATTACH] [ATTACH=CONFIG]24912[/ATTACH] [ATTACH=CONFIG]24909[/ATTACH] [ATTACH=CONFIG]24908[/ATTACH] Product Information: Product - Woo Audio WA7 Fireflies Price - $1,599 Product Page - Link Associated Equipment: Source: MacBook Air DAC: Auralic VEGA Amplifier: Questyle CMA 800R Headphones: Audeze LCD-4, HiFiMAN HE-560, JH Audio Layla (Custom), Beyerdynamic AK T5p Playback Software: Audirvana Plus Cables: Zu Mission RCA Mk.II-B About The Author Brian Hunter I’m a recovering musician turned audio reviewer. I currently manage and write reviews for Audio-Head.com and freelance with several other publications. I love tech and the tools of music, especially the ones involved in reproduction. After I finished my undergrad degree in business I went to the local community college and got one in photography, which was way more fun. I like it when people have unbridled enthusiasm for something and I have the utmost respect for individuals who try to create, even more for those who are good at it.